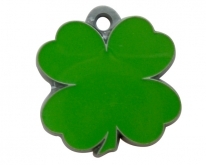 This exquisite metal (Pewter finish) and virtually indestructible ID Tag features a a green enamel shamrock. Unique design that will be commented on by all who see it. Your pet will look sharp wearing one of these unique tags.